Posted on Mobilephones News by ARM on 23 March. Share your iPad 2 s screen with this new accessory! Apple Digital AV Adapter, which offers HDMI mirrored video output. 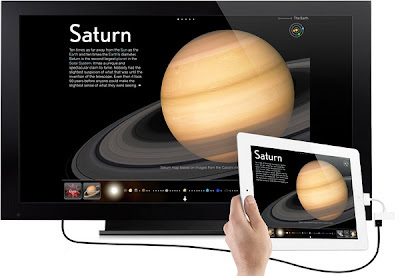 That means that what you see on the iPad 2 screen – slides, movies, photos – can also be viewed on a large screen HDTV, video projection screen, or other HDMI-compatible display, in 1080p. Just plug in an HDMI connector and a dock-connector cable. The HDMI out works with all apps. Using it requires no setup or configuration; it supports rotation, and routes digital audio to screens that support it. 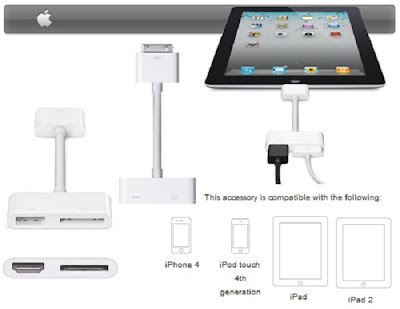 A second built-in 30-pin connector lets you charge your iPad while it’s mirroring. In addition to working with the iPad 2, it also supports video out For the original iPad, the iPhone 4, and the Fourth-generation iPod touch, though mirroring is only supported with the new iPad.